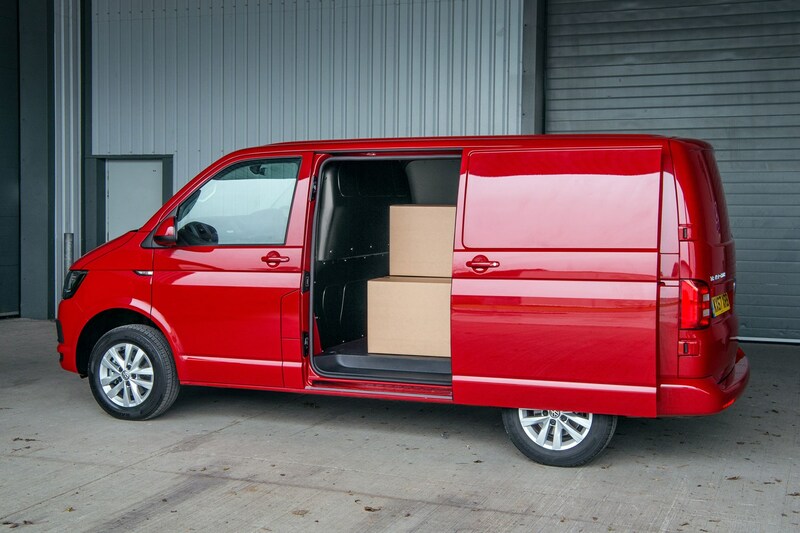 The VW Transporter is one of the most versatile vans in the medium van market sector – and though this sixth-generation T6 variant is based on the same chassis architecture as the T5 Transporter it replaced, this means it has highly developed and practical loading characteristics. The Transporter is deceptively narrow, though the width between the wheelarches is just greater than 1.2 metres, so it is able to fit a Euro pallet lengthways (the long wheelbase version can carry up to three Euro pallets). Plus even the short wheelbase model has a load length of 2,570mm, meaning it is able to carry 8x4 sheet. That said, the Transporter’s maximum payload lags a little way behind the very best rivals. We’ve got all the major VW Transporter dimensions and payload spec info listed below, so keep reading for more details. 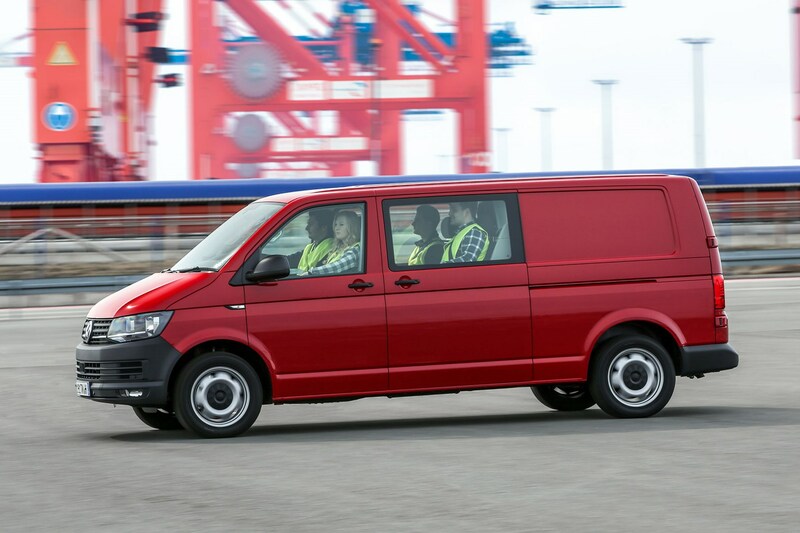 Whereas most vans in the mid-size segment offer two bodylengths and two roof heights, at launch in 2015 the VW Transporter was available with an extra, third roof height. This makes Transporters of this period particularly versatile. However, since the middle Medium roof height was discontinued in early 2018 due to lack of interest from UK buyers, not only can you no longer buy a new one, you'll probably struggle to find a used example, as clearly not many were ever sold here. A consequence of this is that the short wheelbase (SWB - above) Transporter is only available with the Low roof now, as the High roof option is only offered on the long wheelbase (LWB - below) model; previously a SWB Medium roof version was available. Full details of the external and internal dimensions for both Transporter bodylengths and all three roof heights are listed below. The T6 Transporter's standard rear doors - often known as barn doors - open to 180 degrees, although there is the option to extend this to 250 degrees. They have a very wide opening of 1,486mm (around 80mm wider than most competitors at launch), although the standard side loading door is fairly small (1,020mm by 1,284mm). A top-hinged tailgate is available instead of the barn doors if you prefer. This tends to be particularly popular with lifestyle buyers, being large enough to function as a rain shelter if needed. You'll need plenty of space behind the van to open it, however, which can make it impractical in car parks. Up until June 2018, entry-level Startline panel van models were not fitted with a bulkhead, which is good news if you're trying to minimise vehicle weight but potentially bad news for driver and passengers should the van be involved in an accident. However, since June 2018 a full-height steel bulkhead has been standard on the Startline, as it was on Trendline specification and above since launch. All models get half-height hardboard lining (optional full-height lining shown in the image below). The load area floor is uncovered steel as standard on the panel van, with rubber protection available on the options list. You get two interior lights (three for the High roof), and six load-lashing points on SWB models, eight on LWB Transporters. How does the Transporter kombi differ to the panel van? 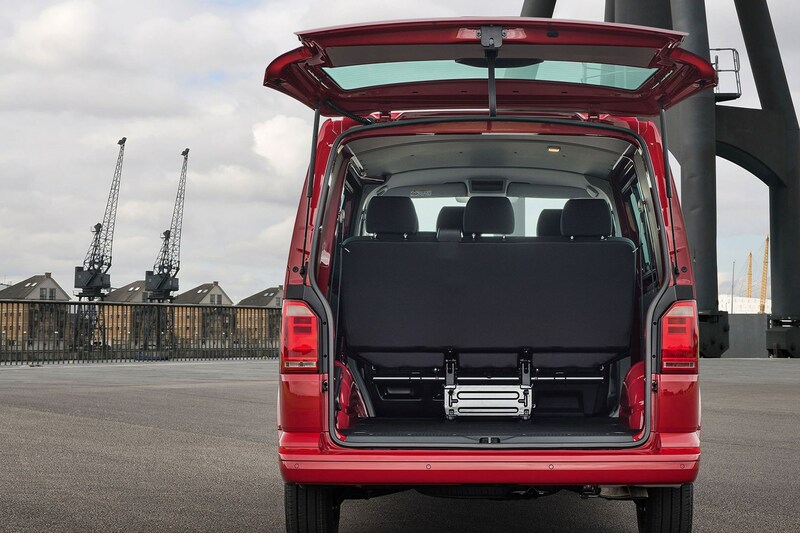 Transporter kombi variants feature a removable rear seat, in combination with an open load area and no bulkhead. This gives you added flexibility, but again at the cost of some safety. A half-height bulkhead is available to be fitted behind the front seats as an option but there is no full-height alternative at all on kombi. Many other medium vans - including the bestselling Ford Transit Custom - are available as double cab models (also known as Double-Cab-in-Van or DCiV). This gives you the second row of seats with a fixed bulkhead behind - safer, but without the facility to remove the rear seats for an extended load area if required. All Transporter kombis do benefit from full height load area panelling, however, and a rubber load floor. 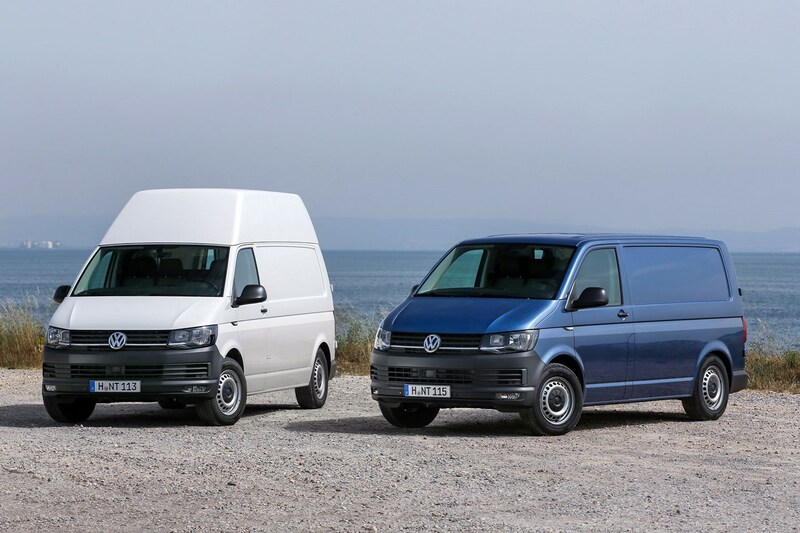 As explained above, from early 2018, the T6 Transporter has only been available to buy new in the UK with a choice of Low and High roof options, as pictured. However, since a Medium roof option was initially available at launch, we have listed the dimensions for these versions in the table below as well. Note: if reading on a smartphone, you many need to rotate the screen sideways to view the entire table below. Again, we've listed the details of the Medium roof models in addition to the Low and High versions, even though the Medium roof was discontinued in 2018. 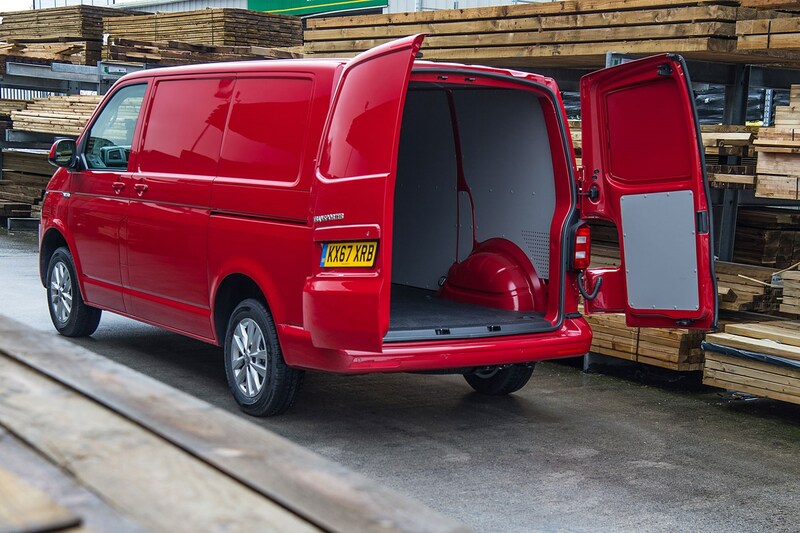 For some context, the High roof LWB Transporter has a whole cubic metre of additional space inside over the equivalent Transit Custom. The SWB Low roof VW has marginally less room inside than the 6.0 cu m Ford alternative. GVW is the total legally allowed weight of the vehicle, including the people and everything else on board. As such, it's important to know exactly which variant you're driving, as this also defines the payload. Most Transporters carry a badge on the back with the relevant T-number, but doublecheck with the weight plate to make sure. Payload for this generation of Transporter ranges from just under 800kg to well over 1,300kg. 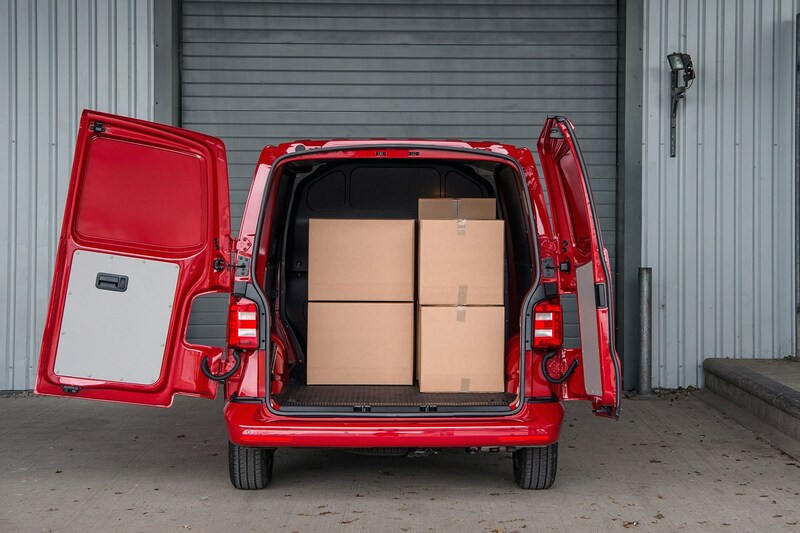 That maximum falls around 100kg shy of the Ford Transit Custom, which itself is a little behind the Citroen Dispatch / Peugeot Expert / Toyota Proace trio, which have the highest payload ratings of any medium vans. 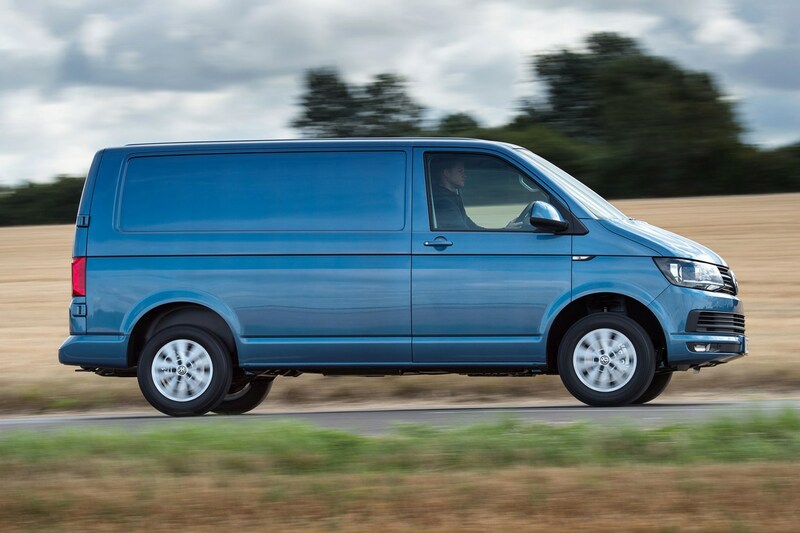 When making comparisons to other mid-size vans, note that VW's official brochures and spec sheets usually give the maximum payload minus a nominal 75kg representing the weight of the driver. Only one other van manufacturer does this (Mercedes), so we've given the Transporter's payload options with and without this 75kg reduction below (most rivals should be compared to the higher payload figure without the reduction). As with all vans, exact payload amounts will vary with trim level, engine type and fitted equipment. Kombi models - which are available in T30 and T32 variants only - have approximately 100kg less payload capacity than the equivalent panel van. Unbraked towing capacity on all T6 Transporters is 750kg. Braked towing capacity ranges from 1,800kg to 2,500kg on SWB panel van models, and from 2,200kg to 2,500kg on LWB panel van models. Kombi models range from 2,200kg to 2,500kg braked, regardless of bodylength.